OHHHHH, I'm stressed out. Today at lunch Jamie told me that she hates to read mommy blogs that are just scrapbooks of their kids' lives. She wants humor! And drama! And swordfights! Swordfights, I've got covered. It's the humor and drama that might be missing from these Thanksgiving posts. Jamie, please feel free to look away. I've gotta appease my family, who lives for the minutia. Things like bowling with 13 kids. Which is what we did the Saturday after Thanksgiving, when we were still in North Carolina. Allow me to fill you in on a little something: When you have a crowd of 23 people, there are precious few places that will welcome you to spend several hours without literally charging you an arm and a leg. A bowling alley, on the other hand, might only charge you an arm. And they might even throw in a pizza and a pitcher of Coke for the bargain price of Just One Body Part. 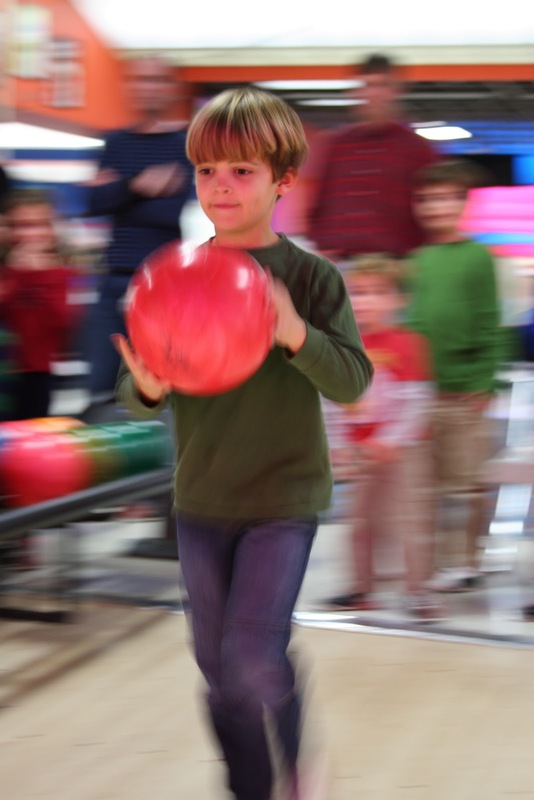 The past couple of Thanksgivings, we have found that very few people seem to think of a Bowling Alley as a place to showcase their Holiday Spirit. I have no idea why airbrushed bowling pins on all the walls, tacky shoes and multi-colored 12-pound balls don't scream "CHRISTMAS!" to everyone. See? Neon turquoise and pink ... TRADITIONAL CHRISTMAS COLORS. We spent a perfectly pleasant two hours on our two lanes Saturday afternoon, watching the kids bowl spares (using the lane bumpers, of course). All the kids had a ball great time. Some of the adults bowled ... some kept the seats warm. I hung out with Amelia and chatted with my sister-in-law and nieces. And Jakey kept me company between turns. Next Thanksgiving, maybe we'll see you there! Just when you get one generation old enough to entertain themselves, another generation starts! It's times like this, I'm glad that we come from a small family! Great pictures. You must not have read my blog from last Thanksgiving! Anytime we are with my hubby's family, we try to go bowling. 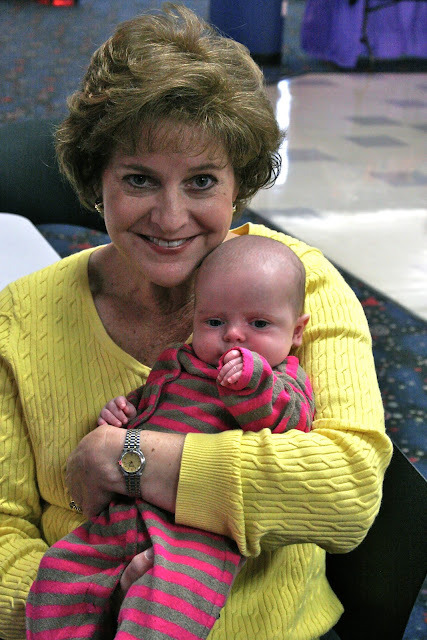 We went bowling last Thanksgiving--maybe not on Thanksgiving but that week. Check out my Kalei girl using the ramp-thingy. Love that thing!